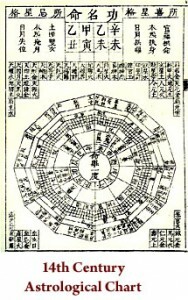 Zi Wei Dou Shu, often called Pole Star astrology, is a Chinese astrological system dating back to at least the Tang Dynasty. The name translates to “Purple Emperor Calculation Method”, implying a special astrology reserved only for royalty. Like Western astrology, Zi Wei’s 12 palaces address important areas of life: Ming (self), Ancestors, Fortune & Virtue (emotional make up), Property, Career, Helpers, Travel, Health, Money, Children, Spouse, and Siblings. However in the Zi Wei system, your chart is populated not by planets but by “stars”, or qi influences, that describe the quality of your life purpose (Ming), and likely patterns or themes in different life arenas. Zi Wei helps you learn how best to apply your energy in life, and follow a path that expresses your true self. What kind of career are you best suited for? What is your fate with money? What types of illnesses should you watch out for? What about marriage, relationships, and children? The Zi Wei chart reveals information about all of these things and, ultimately, can be used as a wisdom system that consistently guides you back to true self. Zi Wei also helps you time important events with methods that reveal your good and bad luck cycles over months, years, and even decades. So if you’re thinking about starting a new business, making a career change, taking a big trip, or getting married, a Zi Wei analysis can identify auspicious timing in order to minimize obstacles and insure success. An initial Zi Wei Dou Shu reading takes about an hour, and can be done in person or via Skype. This first consultation is called a Lifetime Chart, and covers major themes that help you gain clarity about your life purpose, appropriate work, and pathways that promote balance and longevity. Further consultations can be scheduled to look at annual and ten-year cycles, or to explore more details about specific questions. HOW TO SCHEDULE: send me an email with your full name, and date, time, and location of birth. Also include some possible times to schedule a session. I’ll confirm by email. PAYMENT: You can make a payment using paypal (you do not need a paypal account), or, if we are meeting in person I can take payment at the time of our session.